This is a recap of the two day event and my assessment of this historic event. Muhammad Isa Garcia, el argentino who recently translated the Qur’an into Spanish, gave a video introduction from Colombia where he currently resides. Abdullah Danny Hernandez gave the English intro, primarily inspirational, centering on faith and its proper contemplation and regard for the ramifications of tauhid. It was followed by a scholarly historical presentation on Al Andalus by a fluently Spanish-speaking Egyptian researcher named Maryam Saadeh. It covered 903 years of Islamic presence on the Iberian peninsula with special attention paid to the Morisco period. Next, Mujahid Fletcher and Wilfredo Amr Ruiz elaborated on the theme of convivencia, the importance of staying true to its spirit and avoiding those things which rupture relationships and prevent beneficial cooperation. In short, egos need to be checked at the door for true cooperation, co-existence, and convivencia to take place: no gang mentality, no super-organization. Convivencía for the service of humanity is integral. Maryam Saadah added that convivencia is a gift, integral in contemporary society. The Juma khutbah was given by Reymundo Nur, un afro-panameño, on the theme of convivencía that was well received by the primarily Desi/Arab congregation that was in attendance for the main TDC convention. A surprise came in the next session honoring the pioneers. This is the panel I declined to be on and it turned out to be nothing like the one I was apprehensive about. Panelists were brought up singly and given a crystal award for their years of Islamic service and given time to speak about their history. When the panelists were all seated, Abu Sumayya, who was moderating this session began to present awards to individuals and organizations in a display of gratitude and recognition. Two elderly Mexicanas from Chicago were presented awards along with organizational awards to LADO, LALMA, and Alianza Islamica. I accepted the award for Alianza Islamica, dedicating it to those of us who have returned to Allah, Azza wa Jall. I also took that opportunity to mention that the theme of convivencía so bandied about that day was the fruit of a suggestion Yahya had made last November and that it was, in essence, a continuation of an Alianza Islamica tradition. Of note, Maryam Saadah accepted the award on behalf of LALMA and Yusuf Maisonet made a note of my presence in the audience and the inappropriateness of my absence on the stage. The next session was interesting for it included FBI public relations official Cristina Garza. That session dealt with the importance of maintaining good relations with law enforcement. Garza explained the scope of the agency. It was maintained that the focus should be on civil rights for all (ie, immigration). But Muslims must provide a check against abuses. Law enforcement must be held accountable. She ended by mentioning that it was the last day for applying to work with FBI, a recruitment ploy. It was later mentioned that if they had known she would do that, she would never have been invited. The topic of extremism was dealt with in some depth. Fletcher reiterated that the job of the FBI is to catch criminals and that they must be prevented from causing catastrophic loss of life. He equated the current FBI practice of entrapment with way undercover drug busts are conducted. I was uncomfortable with that. In the panel discussion that followed, however, there was a consensus that Muslims should be vigilant when their fellow brother or sister seems to be going off the rails and that the proper tactic is to counsel and guide him away from deviance. FBI has a different approach based on their agenda and Muslims should be on guard. Next session dealt with the problem of obtaining the correct knowledge of Islam. The pros and cons of using the Internet were discussed (Shaykh Google) along with the pros and cons of studying overseas versus studying stateside in institutions like Mishkat University. The value of having a shaykh or mentor rather than relying on books or audio and video tapes was highlighted. It was also announced that IslamInSpanish has partnered with Muhammad Isa Garcia to develop a Colombian chapter of IslamInSpanish with the express purpose of establishing a Spanish language Islamic academy. Abdullah Danny Hernandez and Reymundo Nur heavily emphasized the importance of the Arabic language for the proper study of Islam. There was a general session for all attendees on the “Trump Effect” with Tenessee lawyer Paul Galloway and Mujahid Fletcher. Galloway believes our strategy should be based on our constitutional religious rights as current anti-Muslim attacks are based on legally classifying Islam as a political philosophy and not as a religion that would make us subject to all manner of devastating legislation if not an outright ban. Fletcher told the pack crowd of hundreds if not thousands that Muslims will remain vulnerable if they do not engage civically, render service to the community, and demonstrate that Muslims are an integral and beneficial part of society. The converse to that would be weakness and vulnerability with no societal support when inevitable attacks occur. In another session Fletcher talked about one of the great strengths of IslamInSpanish was its strong emphasis on leadership. He himself said that he was certified with the John Maxwell Group, a leadership training organization that works major corporations. IslamInSpanish conducts weekly leadership training. It ended with a general Q&A and a raffle for umrah which went, alhamdulillah, to one of the elderly Muslimahs previously honored. There was a lot of energy there. I talked to few people on the side and heard testimonials of how IslamInSpanish has brought Islam into their lives. My assessment is that, though they are undermanned, they are firing on all cylinders and aggressively expanding. Their close cultivation of ties to Spanish media (Telemundo and Univision) and their association with key supportive members of the Arab/Desi community has given them credibility and considerable leverage. All in all, even with the inevitable first-time flaws, it was a resounding success that Latino Muslims can build on for the future. On January 30, 2016, Muslims and non-Muslims alike gathered in Houston, Texas, for the most highly anticipated event of the season: the grand opening of IslamInSpanish’s Centro Islamico, a new nexus to bring Islam to Latinos. Bright, sunny, nearly cloudless skies graced the sizable throng, most seated under a protective canopy while the rest stood bathed in the warmth of a Texas winter’s sun. While children frolicked in inflatable castles, the crowd was regaled with speech after speech, each discourse augmenting the auspiciousness of the event, all building up to a momentous climax when the blazing red ribbon at the center’s entrance was cut and curious eyes were finally sated. 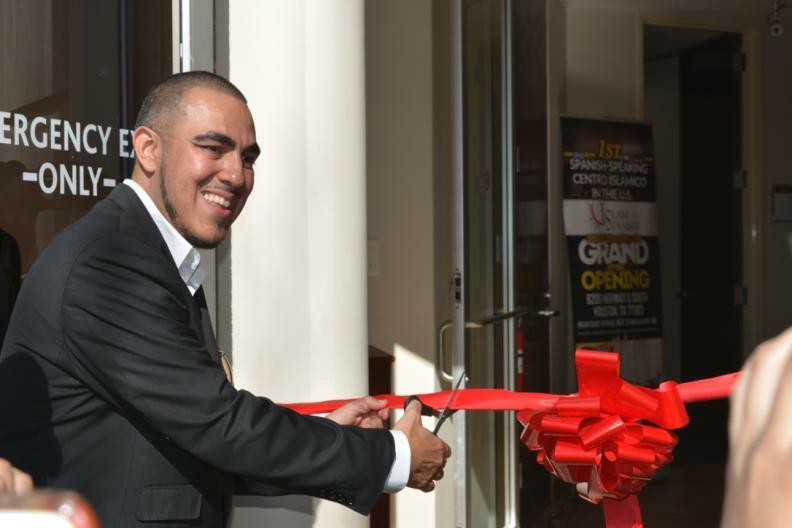 MUJAHID FLETCHER, HEAD AND FOUNDER OF ISLAMINSPANISH, CUTS THE RIBBON TO CENTRO ISLAMICO IN JANUARY IN HOUSTON, TEXAS. It was a triumphal day, after all. Mujahid Fletcher, Abdullah Danny Hernandez, Isa Parada, Nahela Morales, Sandy Sakinah Gutierrez and many others had concentrated their efforts to create, by the grace and mercy of Allah, something full of promise: a brand new center, physically stunning with mosaics, marble floors, decorative arches harkening to the grandeur of Cordoba, tastefully appointed masalah and lounge, and a high-tech recording studio, all run by a cadre of Muslim workers of the highest caliber. There was much to celebrate. Yahya Figueroa Abdul Latif, long-time director of Alianza Islamica, and my wife Faiza and I had made the trek and appeared to be the only New Yorkers. Seating was at a premium, yet my wife managed to find one in the back. To my left was Yahya, sitting off to himself on the curb. It then hit me that we three all had unconsciously drifted toward the rear, observing the proceedings from afar. We were the senior set, 60-somethings just now qualifying for discounts on movie tickets. Before us was the riotous energy of youth, palpable in every part of the spectacle before us as a new generation dawned. It was a study in contrasts. 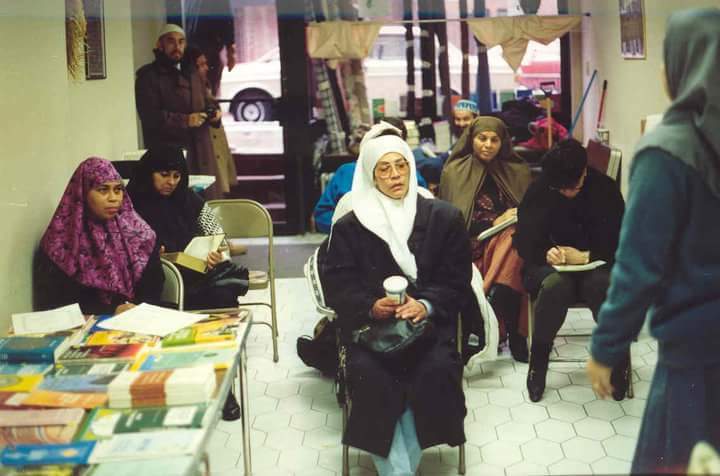 Decades ago, in the early 1990s, another Latino Muslim center opened up, but this was in the heart of New York’s Spanish Harlem, with no fanfare, speeches, ceremonial ribbon cuttings, dignitaries or honored guests. Neither newspapers nor television networks covered it and news of its inauguration probably spread no further than the curious glance of a passerby. 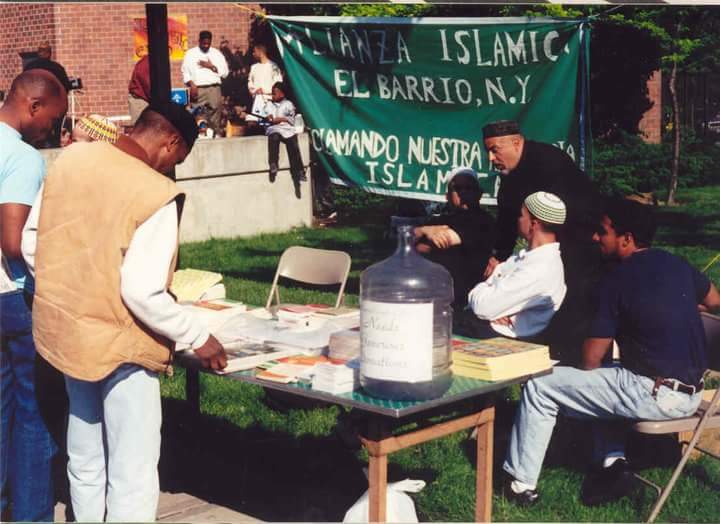 Over the next dozen years, Alianza Islamica became the largest and most influential Latino Muslim organization in U.S. history. Yet its story has lain buried for years in obscurity, in the shadows of neglect and indifference. 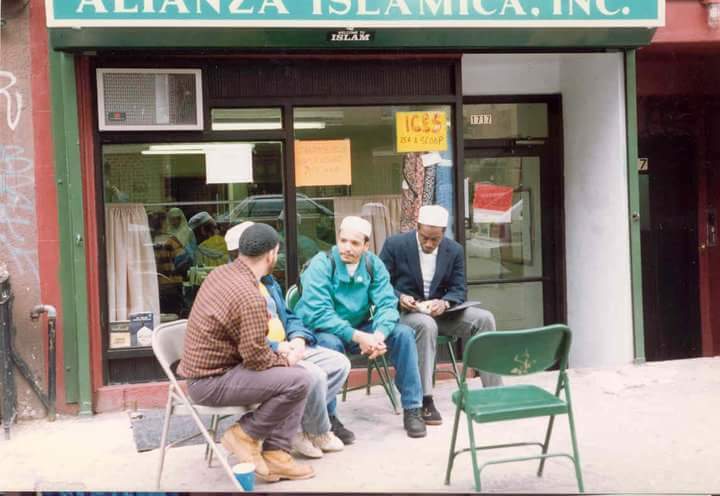 THIS WAS ALIANZA ISLAMICA’S FIRST LOCATION: 1717 LEXINGTON AVENUE. ON THE EXTREME RIGHT IS SHAIKH SHAIR ABDUL MANI, THE PUBLIC RELATIONS OFFICER. By the mid to late 1960s, the pacifism of the Civil Rights Movement had given way to restlessness and anger as minority communities grew impatient with the slow progress of social and economic reform. Into this social milieu, four Puerto Rican teenagers from Spanish Harlem — El Barrio, the fabled iconic center of the Puerto Rican community in New York City — came of age: Mark Ortiz, Freddie Gonzalez, John Figueroa and this author, all living within five blocks of one another. As many youth at that time, we became deeply involved with the struggle for social and economic justice for Puerto Ricans on the mainland and freedom and independence for the island of Puerto Rico. We all became involved with the most progressive grassroots movement of the time, The Young Lords Party, and its ancillary organizations. We entered various phases thereafter, two of us even becoming members of the Five Percent Nation, an offshoot of the Nation of Islam. In time, our collective journey brought us to Islam, and we all became Muslims within two years of one another. John became Yahya, Freddie became Ibrahim, Mark became Abdus and Ray became Abdur Rahim. The Latino Muslim quartet was now complete. A CLASS OR A MEETING IN THE ORIGINAL STOREFRONT. We weren’t the first Latinos to accept Islam in the city, but it was disconcerting to see that some of those who had preceded us — especially the ones closely associated with or members of the predominantly African-American masjids — had become in effect, crypto-Latinos, totally subsumed into the African-American version of Islamic culture, refusing even to speak Spanish in the mosque. It was a jolting obliteration of identity; Willie Colon traded in for McCoy Tyner. This was the early 1970s and ignorance, racism and ethnocentrism were among many factors that heavily influenced the Muslim community. Among immigrant Muslims, a good number had never heard of a Latino accepting Islam, and had trouble accepting us into their community, some going as far as saying that the existence of a Latino Muslim was virtually impossible. Among our African-American brothers, some handled the presence of Latino Muslims in the community awkwardly, especially when it came to dealing with the lighter-skinned and fair-haired. It was a time of Afro-Centrism, when the Black identity was being affirmed and white/fair-skinned dominance was being rejected entirely. Latino Muslims were caught in the middle. To top it off, we had to deal with the perception in our Puerto Rican community that Islam was foreign to our culture, essentially a Black thing due to the notoriety of the Nation of Islam. There were stories in those early days of stern Puerto Rican fathers ripping khimars (headscarves) off their daughters’ heads. For Latinos with a history of struggling to affirm their identity and preserve their dignity, these were clearly uncharted waters. In 1974, we visited a Puerto Rican Muslim group in Newark, New Jersey, called Bani Sakr, whose spiritual guide was Hajj Hisham Jaber, who led Malcolm X’s funeral prayer. For the first time since we entered Islam, we were among other Muslims unashamedly Latino, proudly sporting names like Yusuf Padilla and Bilal Arce. A wedding there was a delight, feasting on sumptuous arroz con pollo to the pulsing percussive rhythms of a conga’s tumbao, an expression of ourselves that no longer looked foreign or alien, something our mothers could relate to. We now had a glimpse of what was possible and were determined to make it a reality. 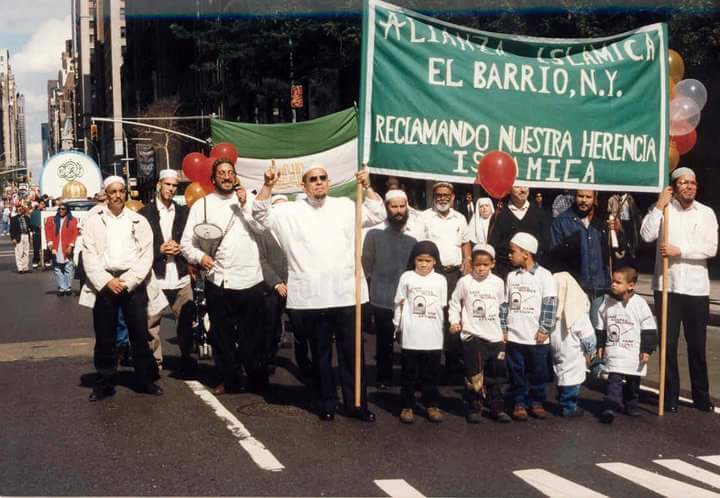 A MUSLIM DAY PARADE WITH YAHYA ON THE LEFT WITH THE RED CAP, THE LATE MUHAMMAD MENDEZ IN THE CENTER, AND RIGHT BEHIND HIM IN AN OLIVE POLO SHIRT IS MUSTAFA RIVERA, YAHYA’S RIGHT HAND MUSCLE MAN. In 1975, we joined the Islamic Party of North America, a Washington, D.C.-based organization that expressed Islam through civic engagement addressing poverty, and social and economic injustice. I went to Washington to work directly at its headquarters while Yahya, Abdus Salam and Ibrahim remained in New York, doing the party’s work of dawah (introducing Islam to non-Muslims) and organizing. Three years passed before we reunited in New York. In 1979, we became part of a pan-Latino group representing Muslims from Costa Rica, Puerto Rico, Panama and Brazil and held a series of meetings toward establishing the first Spanish-speaking masjid in New York City, a place where khutbahs (Friday sermons) and religious instruction would be given in our native tongue. Unfortunately, Muslim leaders — immigrant and indigenous — viewed the project as divisive and damaging to the jamaat (congregation). It met with considerable resistance and received no support from any established Muslim community. A sympathetic African-American Muslim brother allowed us to continue to meet at his apartment, but his local imam, on learning of this, ordered him to bar us from convening there. Shocked and disillusioned, the project lost momentum over time and was eventually abandoned. BAKE SALE TO SUPPORT THE EFFORT IN FRONT OF THE ORIGINAL SPANISH HARLEM STOREFRONT. After the Spanish mosque debacle, Ibrahim Gonzalez left New York in the early 1980s to work at ISNA headquarters in Indiana. While there, he translated into Spanish a very popular dawah brochure: Islam at a Glance or Islam a un Vistazo. These were the days before desktop publishing, so Ibrahim prepared the plates himself and readied them for publication. However, to his stunned disbelief, ISNA’s leadership refused to print the brochure despite the virtual non-existence of any Spanish dawah materials at the time. His anger and frustration were evident in his frequent calls to New York. Ibrahim returned to New York determined to change things around for Latinos and Latino Muslims and, in 1985, came up with a brilliant idea that was to change everything. His plan was to stage an event in the high-profile 5th Avenue venue El Museo del Barrio in Spanish Harlem with a theme highlighting Latin culture’s Islamic legacy. The theme was to be Reclamando Nuestra Herencia Islamica, or Reclaiming Our Islamic Heritage. Ibrahim, Yahya and I put together the event, which featured T.B. Irving — a noted scholar, Quranic translator and professor of Romance languages who passed away in 2002 — headlining a roster of speakers while our families chipped in to supply Latin cuisine. Ibrahim persuaded The Muslim World League to underwrite the event, and it was a huge success, drawing attendees from all over the country. Latino Muslims had finally emerged from the shadows. However, an even bigger dividend was meeting two key men: Carl Askia El-Amin from the Bismi Rabik Foundation in Chicago, and Daniel Ahmad Mena from Florida, who showed up with a duffel bag chock-full of the first Spanish-language Islamic books we had ever seen. After the event, a tri-city collaboration quickly developed, becoming the first iteration of Alianza Islamica. Its first fruit was the first bilingual Islamic journal, also named AlianzaIslamica, which the Bismi Rabik Foundation published quarterly, headed by Carl at the main office in Chicago. We chose this name to demonstrate solidarity and independence. Ibrahim Gonzalez and Daniel Ahmed Mena were associate editors, Maria Cartagena was the administrative assistant, Carl Askia El-Amin was the advertising and circulation manager, and Omar Abdur Rahim Ocasio was the editor. 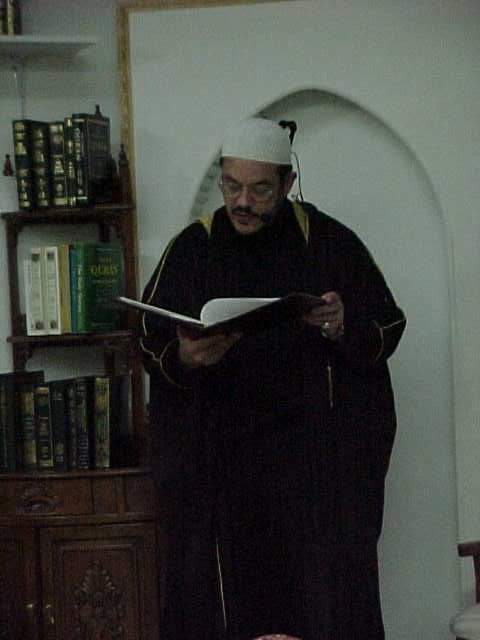 In the summer of 1986, Ibrahim Gonzalez was invited to Indianapolis to attend ISNA’s annual convention, the same ISNA that had refused his constant requests some years earlier to print a simple Spanish dawah brochure. But now, representing Alianza Islamica, he addressed the seminar on Future Strategies for Dawah Work in North America along with a presentation of ISNA’s Hispanic Dawah Program. Ibrahim, by the grace and mercy of Allah, had managed to put Latino Muslims on the map. The world had turned. The tri-city collaboration lasted only about two years; technical, logistical and financial obstacles eventually did in our essentially virtual organization. THE AUTHOR ON THE LEFT AND THE LATE MUHAMMAD MENDEZ ON THE RIGHT AT THE 1717 LEXINGTON AVENUE STOREFRONT. 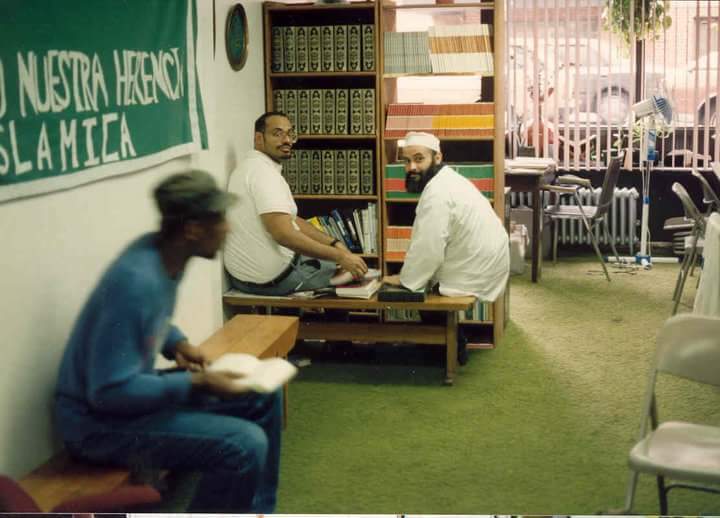 One evening over 30 years ago, Yahya and I spoke of our dream of opening a dawah center in the heart of El Barrio, unassuming and unpretentious, an organic part of the neighborhood where anyone coming off the street would feel at home and comfortable while hearing the word of Allah. But by the early 1990s, all we had to show for it were a string of starts and stops, booms and busts. Then one day after Jumah in downtown Manhattan, Yahya and his friend Khalil approached me and asked if I would give them classes on aqidah (religious creed). At first, it was just the two, then four, then six. They kept coming, brothers mostly and one sister, until all the seats were filled, then all available floor space. We then had to open another class on Sundays due to the increasing numbers of students. Something wholly unexpected was happening. These were newly minted Puerto Rican Muslims, straight out of rehab, who had turned their lives around and were hungering for Islamic knowledge. In time, bonds of brotherhood developed, and Yahya and I agreed to seize the moment and formalize it by creating an organization. When the issue of a name came up, I suggested using the name mothballed and lying dormant since the mid 1980s. (We were unaware at the time that Carl was still publishing the journal under that name.) Alianza Islamica was re-born. YAHYA FIGUEROA ABDUL LATIF, ALIANZA ISLAMICA’S DIRECTOR AND PRIME MOVER. By consensus, Yahya became the director of Alianza and assumed the reins with an aggressive leadership style that moved things along very quickly. Anxious to implement an Islamic activist social agenda, he secured a storefront on 107th Street and Lexington Avenue, solidly in the neighborhood where we all grew up. All the early members and students from the aqidah classes were Boricuas from El Barrio. We had home-field advantage. Yahya’s first priority was dawah, getting the message of Islam out to the people. Alianza’s style was a hands-on, face-to-face street approach. Techniques were employed to increase exposure and interest. For that there were periodic caminatas, where brothers and sisters, even whole families, would walk en masse down 3rd Avenue, Spanish Harlem’s main street, to spark, attention, curiosity and, perhaps, some conversation. In addition, the storefront would periodically attract curious passersby who would come in and hear about Allah in a calm, non-intimidating environment. Conversions grew at a steady pace; at one point, at least 100 families were being served. In addition to his innovative approach to dawah, Yahya pressed for programs that ensured the religious education of members and new Muslims. For this he enlisted scholars the likes of the late Sharif Abdul Karim (may Allah have mercy on him), Ibrahim Abdul Aziz and Ali Laraki. Yahya also realized that, because many neighborhood residents were disadvantaged, GED and English as a second language programs would improve their social and economic situations (some program participants even went on to get masters and doctorate degrees). Health, nutrition and even martial arts workshops rounded out a holistic approach to community development. 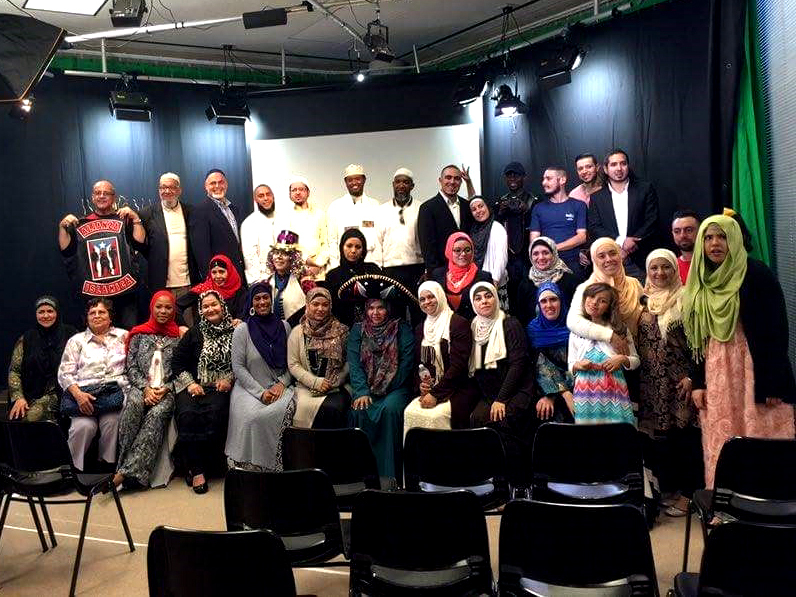 The objective was to make a Latino Muslim part and parcel of the community, to remove the stigma of the alien and break down barriers to reception of the message of Islam. A concerted effort was made to Islamize elements of our culture to give our people familiar reference points. An example was our Eid celebration, held at times at community centers. Instead of the usual Middle Eastern or South Asian fare we were accustomed to eating at Muslim events, we went out of our way to showcase our own cuisine. The sisters of Alianza, many who worked as hard or harder than any of the men, would spring to action with signature entrees like arroz con gandules and pasteles, and desserts like flan and arroz con dulce. My mother replaced the customary pernil pork roast with a leg of lamb prepared and seasoned exactly the way it was typically done, effectively Islamizing our holiday dishes for all to see. Music is a big part of Latino culture, especially of a tropical one like the Puerto Rican culture. Years ago it was not an uncommon summer sight at a playground in El Barrio to see crowds gathered around four to five congueros beating Afro-Boricua and Afro-Cuban conga rhythms into the night. Alianza decided that this part of our culture needed an Islamic expression as well. So at our Eid gatherings, skilled congueros Ibrahim, Yahya and Muhammad Mendez entertained the crowds, the sounds of their tumbaos, bombas and guaguancos emanating from the community center as an open invitation to a new Latin expression. 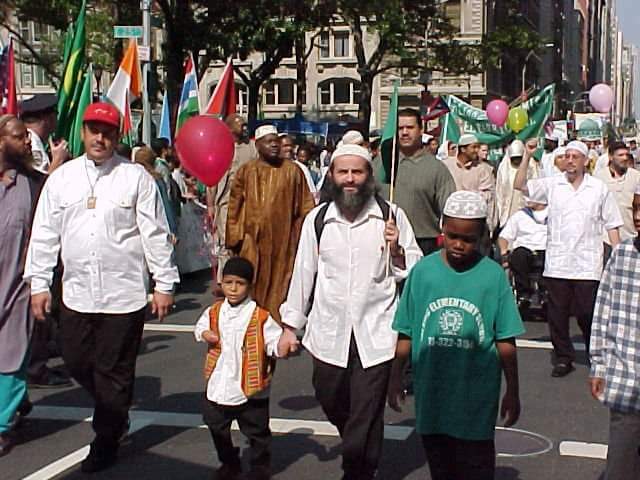 AT A MUSLIM DAY PARADE, SA’ID CONCEPCION IS AT THE EXTREME LEFT AND NEXT TO HIM HOLDING A TAMBOR IS IBRAHIM GONZALEZ, WHO WAS AN ACCOMPLISHED MUSICIAN. 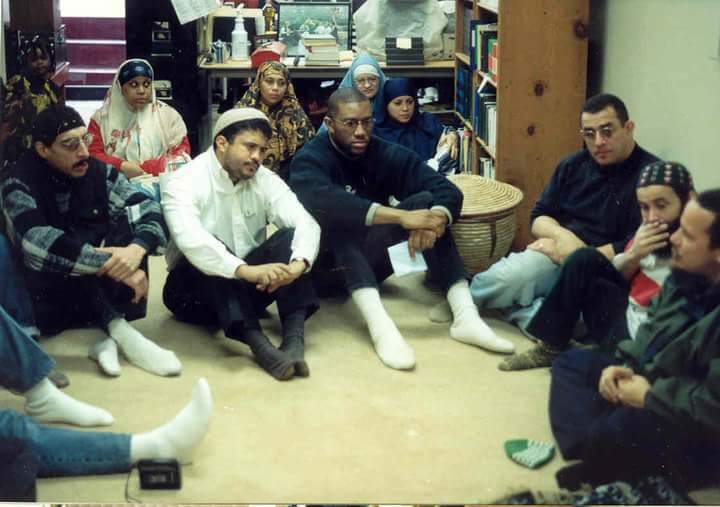 In the early 1990s, the AIDS epidemic was growing rapidly and American Muslim leaders were forced to confront the problem of drugs and HIV infection in their communities. But early reactions to this problem were positively medieval; a Muslim’s death by AIDS was often deemed the wrath of Allah and community members would refuse to wash his body. Yahya attended the Second International Aids Conference in Paris in 1986 and since then had always remained informed and educated about AIDS/HIV. On his initiative, Alianza Islamica became the first Islamic organization to ritually wash bodies of Muslims who had died of AIDS. In addition, it conducted outreach programs to educate Muslims and non-Muslims alike on AIDS and HIV. Yahya recognized that if we were going to draw Muslims from our inner-city neighborhood, many were going to come broken and damaged by drugs, and psychological and social ills. To address this, Alianza was instrumental in creating Brothers in Recovery, the first recovery group with an Islamic bent that has been ongoing now for 29 years. Alianza Islamica also had to combat the problem of local drug dealers. Our next-door neighbors were drug dealers protected by crooked cops. Yahya insisted that Alianza Islamica have good, cooperative relations with law enforcement. This proved very advantageous; with persistence and a big helping hand from Captain Robert Curley and the officers of the 23rd Precinct, Alianza successfully cleared the block of drug dealers. In the 1990s, during Mayor Rudy Giuliani’s administration, an inmate blood feud erupted in the prison on Rikers Island between the Latin Kings, the Bloods and incarcerated Muslims, in which they were slashing one another. Yahya had connections with the leadership of the Latin Kings and on behalf of Alianza Islamica, was able to broker a truce. Mayor Giuliani was so impressed that he offered Yahya the chaplaincy but could not provide the flexible hours Yahya required. A WOMEN’S CLASS INSIDE THE 1717 STOREFRONT. One of Alianza’s most distressing problems was the inordinately large number of spousal abuse cases, overwhelmingly in marriages of Latinas to Arab husbands. The evident predilection for Latinas among immigrant Arabs, especially for those with American citizenship like Puerto Ricans, and a deluge of verbal and physical abuse incidents forced Alianza to offer assistance and badly needed counseling services. Alianza had a cadre of dedicated members who bought totally into the dream of making a Latin expression of Islam a reality and seeing it spread among our people. Shukrey (Fabel) Pabon, Mustafa Rivera, Peter Robbasa, Sa’id Concepcion, Maryam Roman, Safia Figueroa, Mikail (Miguel) Marrero, Abdullahi Rodriguez and others were the indispensable cogs that kept Alianza running. There is one person, though, who deserves special mention: Amin (Frenchie) Madera. Though terminally ill with AIDS, he was our gatekeeper, the one you could always rely on to open Alianza’s doors in the morning and to close them at night. He was available for all that was asked of him, was never cross, always even tempered and would greet you at all times with a smile. Humble, unpretentious and a devoted servant of Allah, he was the best of us and represented the best of Alianza Islamica. 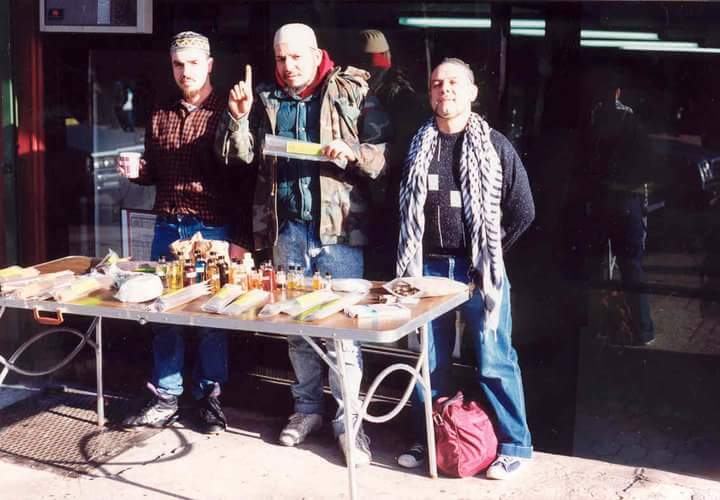 ALI, MIKAIL (MIGUEL) MARRERO, AND AMIN (FRENCHIE) MADERA SELLING INCENSE IN FRONT OF THE STOREFRONT AT 1717 LEXINGTON AVENUE. Though most Alianza members were Puerto Rican, the organization could count on a number of non-Latinos whose contributions were invaluable. Chief among them was Shaikh Shair Abdul Mani, a brilliant Afro-American polymath who grew up in Spanish Harlem, was fluent in Spanish and was the organization’s public relations officer. He brought an urbane sophistication, professionalism and polish to a somewhat gritty organization. Muhammad Omerjee was a Burmese gentleman of Gujarati descent who always sought ways for us to work more efficiently. And Christie Aziza Zimmerman was a German-American firebrand with an indomitable spirit who along with her husband Shukrey were pillars of unflinching support. Finally, of all the imams in the city, no one has been more staunch in his support than Imam Talib of the Mosque of Islamic Brotherhood. He has been there for us in life as well as in death, being the first to offer his services in caring for our dead. May Allah reward him for being a friend to the friendless. In the mid 1990s, Alianza accepted an invitation by a prominent Indian Muslim to move to a building nearby. He, too, had a problem with drug-dealing tenants from the notorious Jamaican Posse and was hoping for assistance in getting rid of them. 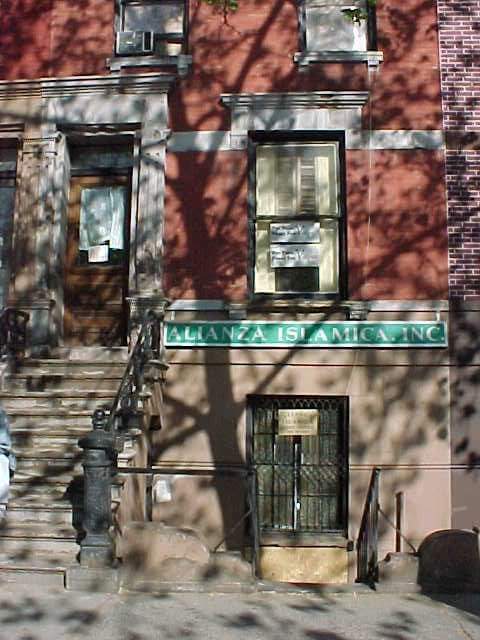 Alianza established La Mezquita del Barrio, the first Latino community-based masjid on the East Coast, and perhaps the country, that we were aware of. Finally, there was a place where khutbahs were delivered in Spanish, ending years of Latino Muslims feeling left out and marginalized. Establishing the mezquita was a milestone for us as it had taken the storefront center concept to its logical conclusion. We could now serve Latinos and Latino Muslims in a way the Islamic Cultural Center of New York just 10 blocks away could never hope to. Ibrahim Abdul Aziz became the titular imam of the masjid, responsible for Friday lectures and spiritual guidance. At the outset, Alianza made a conscious decision not to mimic the masjid model prevalent in the city at the time. That is why we first established a dawah center with a director at its head. Its success then made establishing a masjid inevitable. Unfortunately, relations between Alianza and the building owner deteriorated. After Alianza effectively expelled drug peddlers from his building, the owner initiated eviction proceedings. In 2000, Alianza moved to Alexander Avenue in the Bronx, but torn from its roots, it was never the same. A slow, inexorable decline ended in 2005, with flames reducing to ashes its final resting place. ALIANZA ISLAMICA’S FINAL RESTING PLACE ON ALEXANDER AVENUE IN THE BRONX. Back in Texas, the ribbon was finally cut and visitors poured into the new center. A new day had arrived. Yet for we who were approaching the twilight of life, it was a time to reflect. A journey that began with four Boricua teenagers 47 years ago had brought us to this day. But we were no longer a quartet. Abdus Salam left for Riyadh at the end of the first Gulf War. As the self-titled Latin from Manhattan, he is reported to have brought a great number of GIs to Islam. Ibrahim Gonzalez, the youngest of us and an innovative, determined pioneer, died suddenly in his sleep a couple of years ago, may Allah envelop him in forgiveness and mercy. But there is much reason for hope, for we see in the leaders of IslamInSpanish, as well as the leaders of Latino movements who converged here for this event, the steely fiber necessary to take this effort to the next evolutionary level. Each tribe and nation Allah created represents a brick in the wall of humanity. Latino Muslims form a brick in the wall of the ummah. If our people are indolent, subservient, lacking confidence, dignity or self-esteem, then they are no better than bricks or cinder blocks made of substandard material. And if we do nothing to correct this condition, then we are no better than crooked, unscrupulous contractors placing in the edifice of the ummah something that will not take its weight and jeopardizes the integrity of the entire structure. But if Latino Muslims are to be confident, believe and trust in Allah, and realize that Allah has not only honored them by bringing them to Islam, but that they are also the spiritual and cultural heirs to the best of Andalusian civilization, then they would respect and demand respect and let nothing and no one impugn their dignity. If they need to accept any assistance, they would do so only on their own terms and not based on what looks good on someone else’s annual report. That indeed would be a brick of the highest quality, purity and strength.